I had been waiting a long time to see this movie. It was a "must see" movie for me this summer, as I knew it was going to be a scathing indictment of bush and his presidency, aka his bloodless coup de tat. In preparation, I read Michael Moore's two books, "Stupid White Men" and "Dude, Where's My Country?". (I highly recommend everyone read these books, they are available in mainstream bookstores everywhere). A lot of information from the movie was in both books with most of it in DWMC. As with all books that are turned into movies, there's so much that celluloid can't cover. Let me first say, this was an amazing movie. I think it's extremely important that The Truth be out there because the mainstream media only tells us what they are told to let us know. Knowledge is power and the Truth can be the weapon used to defeat bush in November 2004. This type of film is unprecedented in many ways --- in Hollywood (box office records for a documentary) as well as politics (directly effecting the outcome of a presidential election). However, I must say I wasn't blown away by the film. I wasn't overwhelmed or shocked by anything Moore showed. It's not me being cynical however, it's that I already learned the information from reading Michael Moore's books. That's not a condemnation of the film, not at all. I'm just saying there weren't any surprises for me. Having said that, I know many people don't know the wealth of information in F911 and this will probably be news to most of them as it was to me when I first heard it. They don't know that Bush's family has been in bed with the Saudis and particularly the bin Laden family for YEARS. Or that there was nearly a riot during Bush's inaugueration, causing him to forego the traditional walk down Presidential Way (or whatever it's called). Or that over 100 members of the Saudi Royal Family and bin Laden's family were flown out of the country without being questioned in the days following the attack on the WTC. (If you suspected Osama of the attack, wouldn't you at least want to question his brother about where he might be?). Or that Bush Sr was at a meeting, which included bin Laden's brother in New York City the day before the attacks. But what's amazing to me is that 15 out of the 19 hijackers were Saudi Arabians. If these 15 men had been South Koreans or Iranians, the headlines would have screamed, "America under attack by South Korea!!" or "America under attack by Iran!!" The hijackers were mostly from Saudi Arabia, but the White House and the press downplayed that fact. Nothing about an attack by a specific country. Absolutely nothing. Think about it. Here's my theory about what has happened: Osama hated that his family was in bed with the Americans, especially after we treaded on "sacred soil" (Kuwait and Saudi Arabia) during the first Gulf War. So he started the Jihad war (generalising here). His family wasn't crazy about that idea so they made a deal with him, which paid him $50 million and access to his fortune, not to attack the bin Ladens or the Saudi elite. This deal did not include the Americans, so Osama attacked our embassies and the U.S.S. Cole. Bush and company were warned we might be attacked (by airplanes no less) but arrogant bush and his people probably thought Osama didn't have the guts. When Osama did attack, bush and friends couldn't really go after him because he was family of his "best friends", the bin Ladens and Saudis. Osama is being protected by his family (which he is not really estranged from) and bush agreed not to go after him. Osama is not in a cave. Osama is not running around the hills of Pakistan. Nor Afghanistan. He never was. The bombing of Afghanistan was just for show. Osama is living in a safe and comfortable place, protected by his rich and powerful family. Bush and his people know this. Bush needed a scapegoat. Enter Weapons of Mass Destruction. Enter Saddam Hussain. Anyway, the movie did evoke strong emotions in me about why we invaded Iraq and how we have devastated a country that is now far worse off than it ever was with Saddam in charge. Granted, Saddam was despicable and needed to be overthrown. But by the Iraqi people, not by an invading foreign army whose only interest is digging up the vast wealth of oil in the ground. A wealth of natural resources that belongs to the Iraqis, not US, by the way. One criticism I have about the film is that Moore should have pointed out that while the Army had hundreds of troops protecting the oil fields during and after the invasion, they didn't much bother with the historical ancient museum in Iraq. They let anyone loot the place, destroying or stealing artifacts that date back to the very Birth of Civilization. Those artifacts can never be replaced. EVER. That makes me sad. Another way the film was quite powerful was that it showed the devastating effects the invasion has had on the Iraqi people, on our soldiers who don't know why they have been forced to occupy a country that doesn't want them, the emotional toll it has taken on those soldiers who have degenerated into sadistic perverts, and the toll it has taken on the mothers and fathers and relatives of these soldiers. The images were quite graphic in the violence it showed when our bombs hit Iraq, although there wasn't much on the retalitory violence by the insurgents. It's no surprise that Iraq is still a violent place today, over one year later. Despite their tactics (and I'm not condoning any of it), these people want us out of their country. NOW. Desperate people do desperate things (like beheading) and I believe the violence will not stop until we go home. Bring the troops home NOW where they belong. 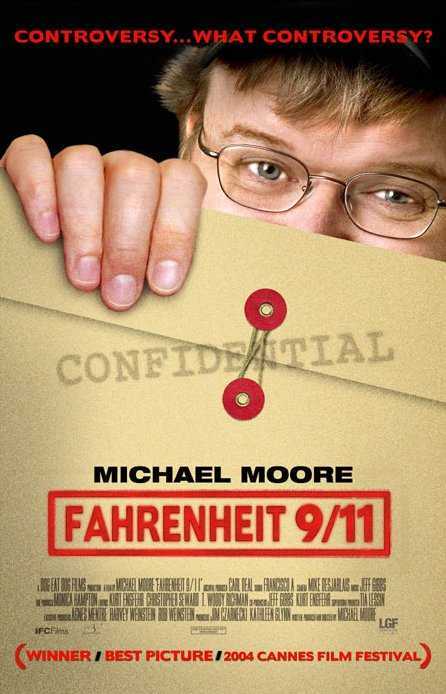 Michael Moore struck a nerve with this movie. The box office numbers prove that. There is a grass roots movement springing up that has bush and his friends shaking in their oil slicked boots. Sometimes all it takes is ONE GUY to stand up and say, "hey, wait a minute, what is going on here?!!" Michael Moore has done that and others are asking the same question. Even in bush strongholds like Texas. Hopefully, the we'll wake up and vote the not-elected President out of office. As my friend said as we were leaving the theatre, "Thank God for Michael Moore!!". I couldn't agree more.